The tragus is the small projection of cartilage immediately in front of the ear canal. Piercing it involves perforating the cartilage with a small-guage, hollow needle and inserting jewelry, either a ring or a stud. The tragus is vulnerable to infection, so take care to find a professional piercer who follows proper procedures. It is also true, however, that tragus piercing is not that painful, as there are very few nerve endings around the area. Tragus piercing is a relatively recent fashion. Before you get yours pierced, make sure you are confident about the piercer. An experienced piercer will use a hollow, low-gauge needle. 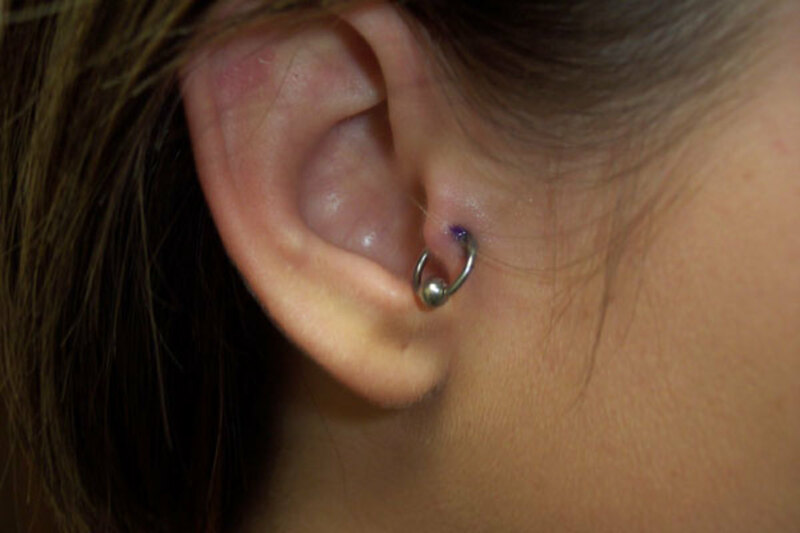 It should be inserted either straight into the tragus or a curved direction. Pain will be the trongest during the actual piercing. There will continue to be some discomfort over the following few days, but with a good aftercare regimen, the entire process is completely bearable. 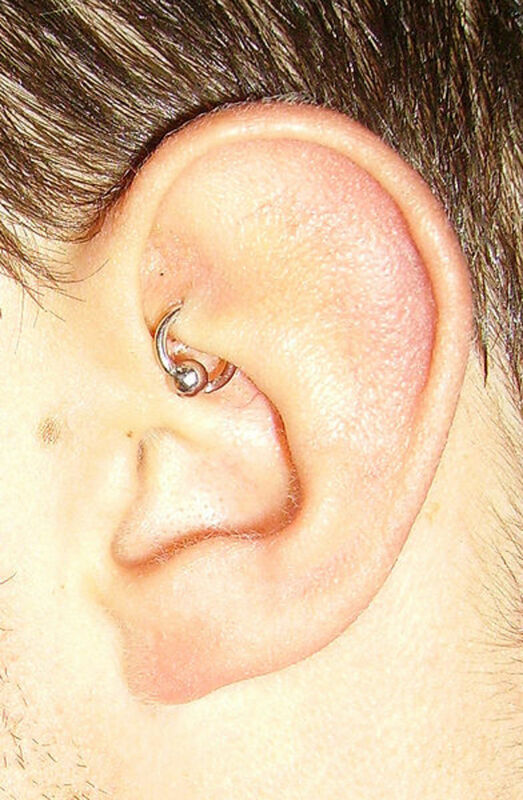 Clean the tragus with saline solution immediately before and after piercing. This will significantly minimize pain. There are different concentrations of saline solution. 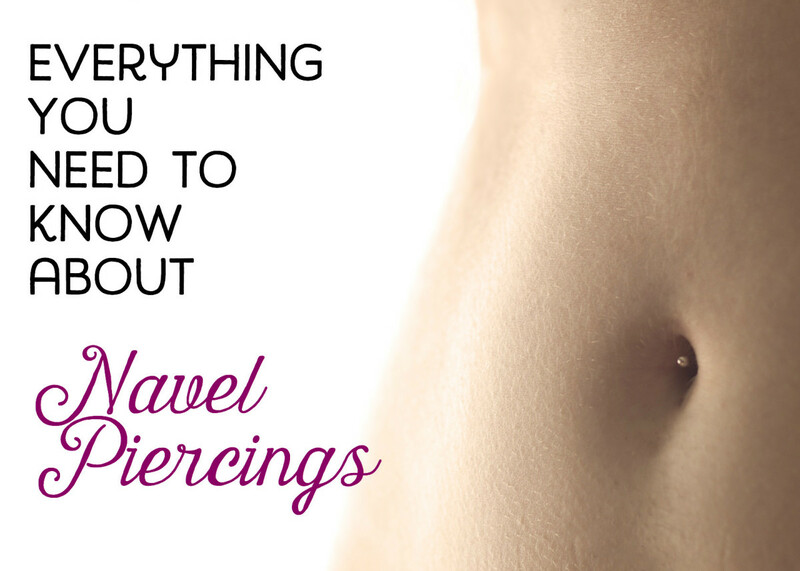 Ask your piercer which might be best for you. Don't touch the pierced area and jewelry. Even if there is irritation, leave the tragus untouched for at least 5-7 days. Clean your hands with antibacterial solution before changing earrings. Don't let anyone else touch the area. Clean the area at least twice or three times a day after piercing. This will help reduce pain over the next few days. Don't change earrings until six weeks after piercing. Make sure to use a cotton ball that has been soaked in disinfectant, such as alcohol or hydrogen peroxide. Don't sleep on the same side as your piercing for a few weeks. Aftercare is vital. In addition to the steps listed above, follow these steps to avoid infection and speed healing. Clean the area with a saline solution and a cotton ball at least twice every day. 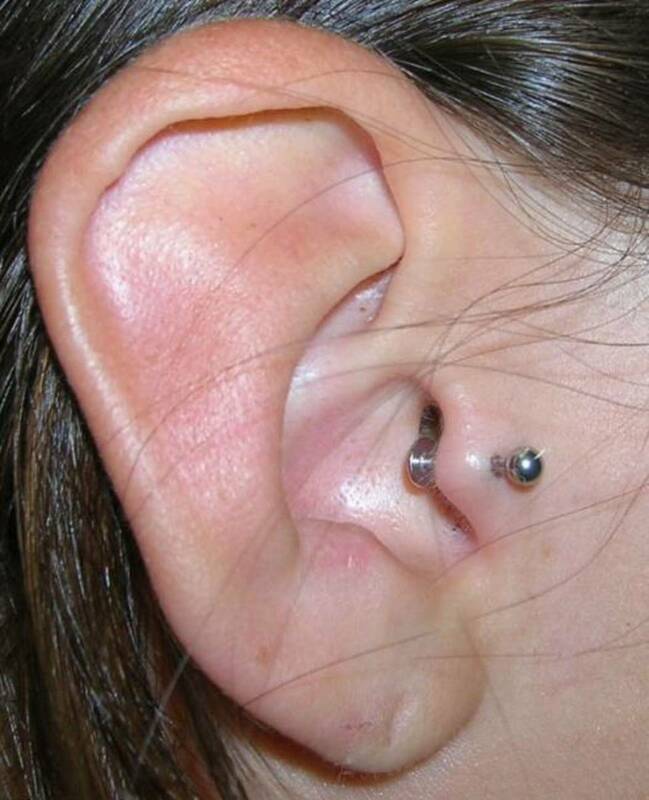 While doing so, make sure to also clean the area behind the tragus. This will ensure that the solution reaches deep inside the hole. While cleaning, rotate the jewelry slowly and gently but avoid touching the skin directly with your fingers. Don't touch the area at all. Avoid using the pierced ear to answer the phone. Try to sleep on the opposite side. Change your pillowcase every day and keep your hands clean. It's easy to make saline solution at home. A typical solution is .9% saline, about the same as human tears. Combine the water and salt in the pot. Cover and boil for 15 minutes. Set pot aside until cool. Carefully pour into jar or bottle and cover. Use within 24 hours, as bacteria can grow in saline solution. There is a possibility of infection with any kind of piercing, but the only reasons this would happen is if proper aftercare is not followed or the piercer is not experienced. During piercing, the tragus will bleed and may continue to bleed for a few hours. Afterwards, it is common to experience pain and swelling for a few days. There is no need to worry as long as they subside within seven days. Even if you notice any of these symptoms, don’t panic. Do not remove the jewelry yourself, as this may cause the hole to close and trap infection within. Consult a specialist. 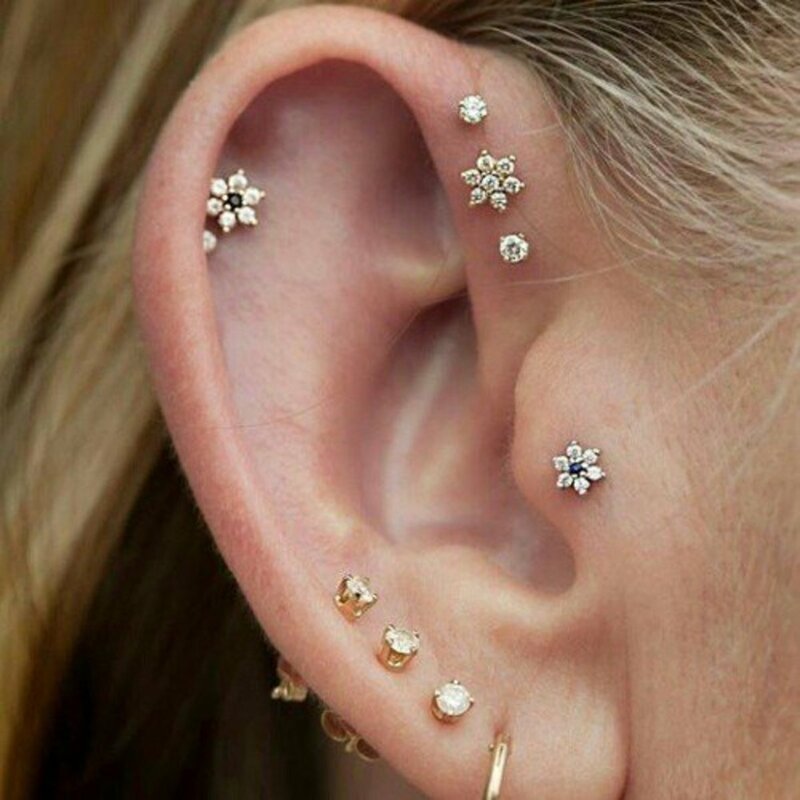 Which is your favorite type of ear piercing? I went for it a belly piercing andit easnt to painful wehn it was pierced (probably cau se he went through a stretch mark and I was standing when he marked the pierced mark he wanted to Pierce. I am totally new and never been body pierced so I thought I knew what he was doing well.......... He then had me lying down in my back and he continued to do the piercing I don't qustion cause I thought I know WTF he was doing. I was told to avoiding table salt by piercer and use sea salt ! I got my tragus done 2-23-17 and I love it. It really have not had that much pain. I am just worried about infection. I don't have one now but it is just a fear. It hurt so much when I got both left and right ears done. Got them done on the same day. I had mine done 8 days ago and I bled a lot once it was done. She said to rotate, move the earring so it does not get stuck. I'd like to get it changed out in 2-6 months with a stud or barbell. It hurts to move it and its very hard to move it or rotate the hoop; its hard to tell if its being moved or not moving. I got my tragus pierced a couple weeks ago and I feel like my hole in the back has stretch. I afraid I will accidentally pull the bar through the hole. What do I do? Got my tragus done 5 months ago and I really love it. Yeah my mate when we were drunk hit more like punched my ear had a wee infection but it cleared up so easy. Its normal for diabetics and piercings to take longer to heal. No pain when done so go for it I got my peirceing and bar for 25 quid in scotland. I have lobes industrial and tragus in my right ear snake bites. Ive had my tragus pierced for a year (this is the second time) .. when i first got it pierced in was in the middle of the cartliage after battling pain and soreness it finally subsided however its moved to the top of the cartliage and is now just under the skin. I just got my tragus done a few days ago. For me, it was by far the most painful piercing, and I have many piercings. It was fine for a day or so after, but it gets very sore. The whole right side of my head feels like a big bruise, which aches when I eat, or even smile. I've also had a lot of scabs and blood every time I clean it with my saline solution. Which, is what my piercer recommended I use. Thinking about switching over to my H2ocean spray to see if I get any better results! I've had my tragus pierced for about 1 year and a half now... this is the second time I had it done. It is by far the most painful piercing I have. The first time I had it done 5 years ago I passed out from the pain. The second time I just got a little nauseous. But it's SO cute it is well worth the pain. I did however BOTH times have a keloid develop next to the piercing, just kept cleaning with h2ocean and it eventually went away both times. I have 2 scaffolding, 2 Tragus,2 Spaces and eyebrow, but my other Tragus didn't bleed at all but my other one today just little bit of blood? To answer some questions & verify things: Always go to a professional tattoo/piercing place for piercings other than lobes, (even then still recommend a piercing artist)! You can shatter the cartilage. A saline solution is a teaspoon of non iodized sea salt and warm water that's been sterilized, (boiled) or h2ocean. Just had my Tragus pierced today and can honestly say I felt only a slight pinch as he pierced it. It's my 11th piercing and will say it's the least painful one. Ive had my tragus done for 3 month now. It got infected bad had to go to the doctor and was on antibiotics for 2 weeks tried salt water ,tea tree oil and still not fully healed. I just got my piercing to both of mine this past Saturday, no problems so far, but these two piercing by far hurt the worse. I have had my nose,eyebrow, and lip pierced before but I can say I like these two the best out of all of them. Is it bad to get both ears done at the same time? Wouldn't it hurt to sleep at night? I just got my Tragus pierced and it didn't hurt at all. This was the second time I had it done. I just got my tragus pierced today and let me tell you, I have 6 tattoos and a few piercings (my tolerance for pain is pretty good) and I screamed like a little girl using some not nice words. Most painful one yet. But after about 2 hours I can't feel anything. I got it done on both ears and the only thing that's bothering me is a little swelling. Overall, I love them! Got mine done yesterday and all I can say is ouch. But wasn't too bad and for all my ear piercings I've used salt and boiling water cooled down to clense them had no problems. I just got mine piercing two days ago or something and the piercer didn't tell me anything about the saline solution!!! Where can I get it? Could it be available at pharmacies since I live in a country that doesn't sell saline solution in grocery stores. Please help me out!!! Mine was $40 and I tipped the piercer. So, it was about $47. Also not to scare anyone, but I have 3 tattoos, and 6 piercings. My tragus was by far the most painful. I almost passed out. I am aware that tattoos are a completely different type of pain, but I'm just giving some reference. I got my tragus pierced today and my guy did an amazing job. It didn't hurt at all i just felt some pressure. He pierced my rook too and I had no problems with that either. Love this piercing! H2ocean is a great saline solution to use. I've used it on all my piercings and they all healed rather quickly. Yes there is such thing as having a small tragus-if a trusted piercer said it was to small do not go and try to get it someplace else because then you could really damage your tragus. I went to get my tragus pierced but the piercer said that it iss too little and small so it can't get pierced, should I go another piercer or there is something really like a small tragus so it can't get pierced? Please reply. Xoxo. I got mine done about a month ago, not very painful at all. They put a barbell in it and I want a hoop,preferably a captive bead. I used to have my tragus pierced but I took it out for work. I've had it done again but they didn't pierce through the scar tissue, they've done it just next to it. I love it but every now and then l move my neck or smile and it hurts inside my ear near the piercing and down the side of my neck. Is this normal? I don't remember this happening last time. I had my tragus pierced over 7 months ago, i can't seem to loosen the ball, and i have new jewellery to put it.. Anyone know any tips on how to loosen it and what way to loosen it, pierced on my right ear. I want the tragus piercing soooooo bad but I'm still scared about the pain and aftercare. JUST GOT MY TRAGUS PIERCED YAY! I've had mine pierced for almost two years and you can wear earbuds as long as their small. It can feel a little awkward to get them in after its healed. I wouldn't recommend putting them in until it heals. I'm really thinking of getting one but can anyone asnwer this please, when you've had it for a while (so that it has healed and all) can you use earphones to listen to music just as usual or woulf that be impossible? Love the flower pircing in the picture. Where can I get it from??? Any help?? i just got this pierced yesterday. i have pierced my tongue and nose and naval and this was by far the most painful one. all of my other piercings were quite painless so u wasn't exactally ready for this one to be painful! surprised me. it really does depend on the person. Just got my piercing a couple hours ago and I don't feel any discomfort at all. It was actually quite painless for me to be honest. I was expecting soooo much more pain. I guess it's different for everyone. I'm happy with the way it all went. Hello, which saline solution do you use ? I just had my tragus pierced yesterday and it was a bit painful, especially while inserting the jewelry, it felt huge amount of pressure. Today it feels normal, no pain, soreness, and i forget its even there oh and I LOVE IT!!!! Never rotate a new piercing, it just rips the newly healing cells around it and causes the healing time to dramatically increase. Otherwise it sounds like good advice tho. The tragus is a cute piercing but still scared about it. 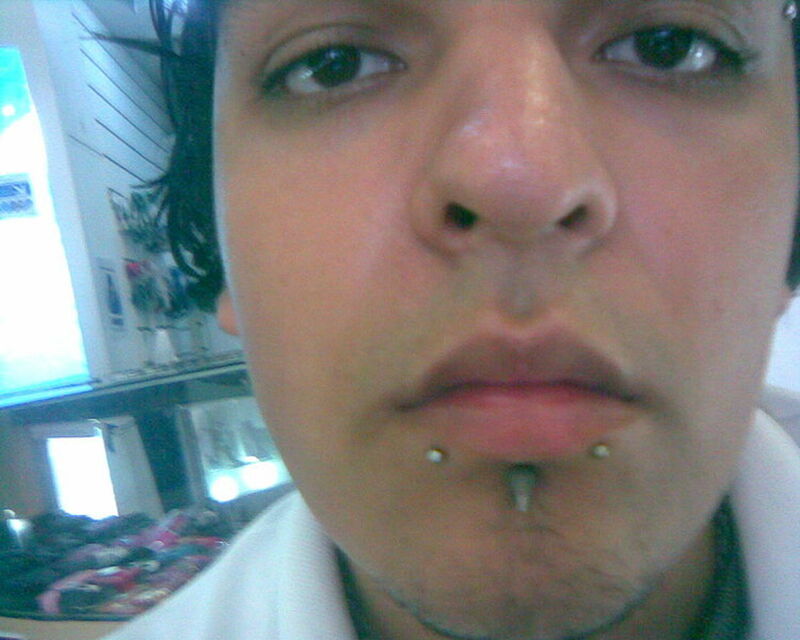 I actually have never seen this type of piercing, very interesting.